Many cultures from around the world speak of mythical lands, sunken cities and lost kingdoms that have defied all attempts in being discovered. It’s possible these mysterious civilizations have come and gone, reaching back further in time than history will ever know. There forgotten lands, if discovered today, could shed light on our ancient culture via their ancient structures, cryptic hieroglyphics and forgotten artwork. Atlantis was a mythical island that was said to have sunk below the ocean. It was first mentioned by Plato at around 350 BC, who wrote about a beautiful island in the Atlantic Ocean that was swallowed by the sea in one day and one night. He wrote two books about the history and culture of this mythical island. Another sunken city was Ys, which legends claims reached back as far as the prehistoric era where a settlement was built off the coast of Douarnenez, France. The myth states that Gradlon, a King of Cornouaille, built a city within these walls on the request of his daughter Dahut who loved the sea. However, one day a wave as high as a mountain collapsed on Ys, dragging the city to the depths of the ocean. Lemuria is the name of a lost land located somewhere in the Indian or Pacific Ocean. The island was not based upon legend but rather scientific guess. Though Lemuria is no longer considered a valid scientific hypothesis, it has been adopted by occult practitioners who believe a mysterious continent once existed in the ancient world that has now sank beneath the ocean as a result of a cataclysmic event. Mu is the name of a hypothetical lost continent proposed by 19th-century traveler Augustus Le Plongeon. He claimed that several ancient civilizations, such as those of Egypt and Mesoamerica, were created by refugees from Mu, which he located in the Atlantic Ocean (others suggest the Pacific). Today scientists dismiss the concept of Mu as physically impossible, arguing that a continent can neither sink nor be destroyed in the short time required by this premise. Avalon is a legendary island featured in the Arthurian legends. It first appears in Geoffrey of Monmouth’s 1136 ce “historical” account British history. Within his book he claimed that a mysterious island to the west of England had forged Arthur’s sword Excalibur, and later acted as a place of refuge after Arthur was wounded in the Battle of Camlann. Avalon was has always been associated with mystical practices and supernatural beings. Agartha is a legendary city that is said to reside under the earth’s surface. It was first mentioned in the west by Alexandre Saint-Yves d’Alveydre who proposed that this hidden civilization protected of secret knowledge and incredible wealth. Theosophists regard Agartha as a vast complex of caves underneath Tibet, inhabited by supernatural creatures called asuras. In Tibetan and Buddhist traditions, Shambhala is an ancient kingdom hidden somewhere in Inner Asia. It is mentioned in various ancient texts, the oldest being the Bön scriptures (which vastly predates Buddhism). 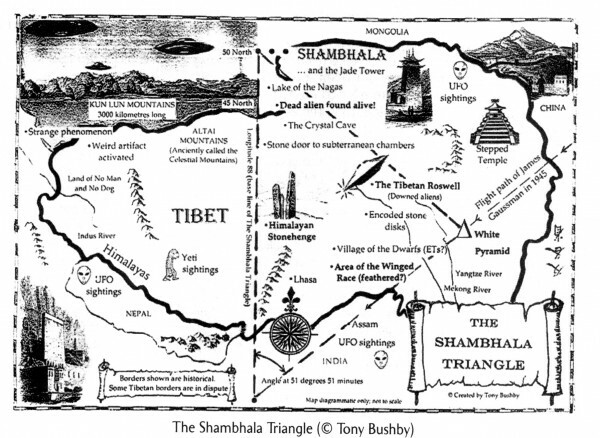 They all see Shambhala as a pure realm that lies on the edge of physical reality, connecting this world to the next (a gateway between the physical and spiritual realms). Only the most enlightened of beings can enter this paradise, (indeed, Tibetan lamas spend a great deal of their lives in spiritual development before attempting the journey to this mythical realm). In Greek mythology, Hyperborea was a mythical land situated “beyond the North Wind”. The Greeks believed it was a fertile paradise that lay far to the north of Thrace, ‘where the sun shone twenty-four hours a day’ (which to modern ears suggests the Arctic region). However, it is also possible that Hyperborea was not a physical location at all, for according to the Greek poet Pindar, neither by ship nor on foot would you find the marvelous road to Hyperborea. Thule was first mentioned in classical European geography as a region that lay far to the north of Britain. Prior to the 19th century, many thought of this northern mystery as hell, surrounded by raging volcanoes in the midst of a frozen wilderness. Conversely, after the 18th century, it came to be known as a land of plenty; where fish were caught abundantly and there was plenty of grazing for the production of meat and butter. The legend of Thule has therefore been appraised as being both heaven and hell. The term ‘Ultima Thule’ denotes any distant place that is located beyond the “borders of the known world”. 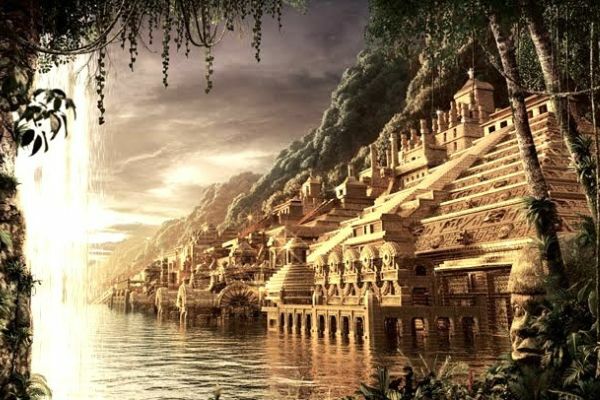 When Spanish explorers arrived in South America in the early 16th century they heard rumors of a lost city called El Dorado which was filled with gold. Local folklore said that every time a new ruler was appointed in this city, gold and precious jewels were thrown into a lake called Guativita. This lake was found it 1545, by explorers who managed to lower its level enough to find hundred of pieces of gold along the lake’s edge. However, attempts to drain the lake further have remained unsuccessful, and the city of gold remains lost. Paititi is a legendary Inca lost city which was the equivalent of a western utopia. It was said to be abundant with food and mineral wealth. Folklore places this forgotten city somewhere within the remote rain forests of Peru, northern Bolivia or southwest Brazil. The Paititi legend revolves around the story of the culture-hero Inkarri, who, after he had founded Q’ero and Cusco, retreated toward the jungles of Pantiacolla to live out the rest of his days in his refuge city of Paititi. Brasil is a phantom island which is said to lie west of Ireland in the Atlantic Ocean. It is described as being cloaked in a perpetual mist, except for one day every seven years, where its incredible beauty became visible to the naked eye. Expeditions left Bristol in 1480 and 1481 to search for the island; but nothing was found. Then, in 1674, Captain John Nisbet claimed to have found the island when on a journey to Ireland. He described strange black rodents and a magician who lived in a stone castle. A follow-up expedition by captain Alexander Johnson also found Brasil, confirming the same findings. But then, Brasil reverted to its elusive self. Only a few sightings have been made since.